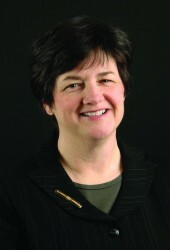 Janet Alexander Griffin is the Artistic Producer for Folger Theatre. Under her direction Folger Theatre has mounted 70 plays, including more than half of Shakespeare’s canon, and has been honored with 84 Helen Hayes Award nominations and 17 awards for excellence in acting, direction, design, and production. Last year, Folger Theatre received a record 19 nominations for the three-play season including an Outstanding Play nomination for each play of the year (Henry VIII, Orestes: A Tragic Romp and Hamlet). Hamlet took the evening’s top honors as Outstanding Resident Play of 2010. Janet has also led Folger Theatre’s development of new work which includes the recent world-premieres of Cyrano by Edmond Rostand, in a new translation by Michael Hollinger; the late Lynn Redgrave’s plays Shakespeare for My Father and Rachel/Juliet; Roger Rees’ one-man show What You Will; Playing Juliet/Casting Othello, and Melissa Arctic (a modern day musical retelling of The Winter’s Tale) – Ms. Griffin is also the Director of Public Programs for the Folger Shakespeare Library, where she has overseen the growth of the Folger Consort early music series – now celebrating 30 years – the O.B. Hardison Poetry Series, and the PEN/Faulkner Fiction Award and reading series. 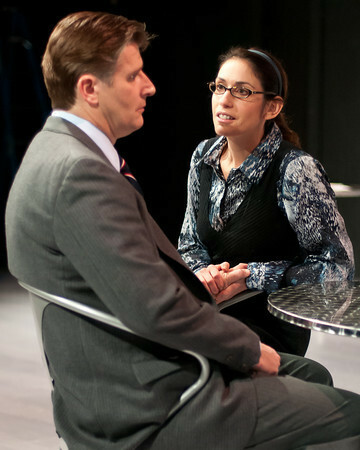 Where did you work before you came to Folger Theatre? 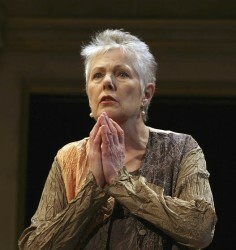 Lynn Redgrave in ‘Rachel and Juliet’ in 2009. Photo by Mig Dooley. My work immediately before coming to Folger was as a graduate student in Ireland, where I did my thesis, not on Shakespeare, but rather on George Moore, who wrote the fabulous short story Albert Nobbs, which Glenn Close has just produced as a movie. What are some of your favorite Shakespeare plays or performances? It’s hard to think in terms of favorite Shakespeare plays – impossible to compare the heartrending tragedy of what is done to Lear with the charming deception perpetrated on Benedick. So I can only think of favorite productions or performances. Actually two of my favorites were Derek Jacobi’s Lear, so clear and believable in his regal demise into madness, and then almost 30 years earlier, Jacobi’s Benedick, which is perhaps the funniest, most delightful performance of that prickly, love-lorn character imaginable. 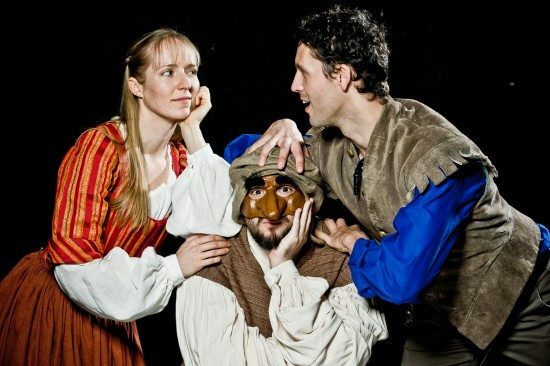 Your season usually consists of two Shakespeare plays and one play that is not written by Shakespeare. What is your criteria when you are selecting the non-Shakespeare slot? We always try to do something a little unexpected with the “other” play – perhaps something completely new like Anne Washburn’s telling of Orestes or Craig Wright’s wonderful Melissa Arctic, which reframed The Winter’s Tale. Or, in the case of this season, we are rediscovering a play – The Gaming Table – written by an amazing, if almost forgotten, woman of the 18th Century, Susanna Centlivre, whose 19 plays were hugely popular in the London of her day and should also be in ours. There are many theatres that produce Shakespeare’s works. What makes coming to see a Shakespearean production at Folger Theatre a unique experience? 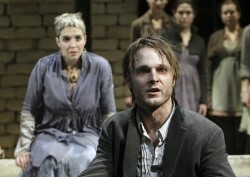 Jay Sullivan as Orestes and Holly Twyford as Electra at Folger Theatre in 2010. Photo by Carol Pratt. Shakespeare is like a great 7-layer dip. You can dig in to almost every play and find a different combination of guacamole or sour cream! So each production can offer up something surprising. The intimacy of the Folger Theatre gives actors the chance to speak to the audience up close, virtually to tell the stories in their natural voices and look into the eyes of the viewers, which makes for a wonderful shared experience. And, uniquely, Folger Theatre can draw from our colleagues – all the many Shakespeare experts down the hall who are surrounded by the books and manuscripts of the Library’s priceless collection. What do you consider to be your greatest accomplishment since coming to Folger Theatre? The thing I’m most proud of developing – and accomplishing with the wonderful, dedicated people with whom I work – is the crafting of a successful model for the public programs. Folger is not only theatre but an integrated part of a larger important insitution with other immensely valuable programs, including performing arts like the early music of Folger Consort; literary programs including the the O.B. Hardison Poetry Series and PEN/Faulkner Reading Series, which bring the country’s most extraordinary writers to us; and Folger Education which is working so effectively to share the soul-saving arts and humanities with all, from the youngest minds to the most academic. It’s completely tricky, but completely rewarding.